Chocolate and coffee cake - the most simple recipe! Today I want to present you a wonderful cake - one of my current favorites and the latest discoveries - is adapted Chokolate cake Deluxe Linda Lomelino. The porous, moderately moist (not require any impregnation), with bright taste of chocolate and coffee aftertaste - it's just a godsend for chocolate lovers, and coffee too! And most importantly - a biscuit is very simple to prepare, no tricky stuff, fancy foods, numerous manipulations and eight proteins in the composition :) Everything I love! Why I decided to pay special attention to the biscuit (instead of the cake as a whole)? Because it is perfect for use in many cakes, cupcakes and other confections, becoming, so to speak, your "base". It is well kept in the refrigerator (up to 5-6 days) or in the freezer (2-3 months). vanilla extract - 1 tbsp (or a pinch of vanilla). It's all very simple (even there was no need to do step by step photos, as only a few steps). Mix in a large bowl all dry ingredients, including sugar (flour, baking powder, baking soda, cocoa, of course, you need to sift). Beat eggs at medium speed without stopping, add the buttermilk / yogurt. After adding a little butter and whisk. Pour the liquid ingredients to the dry and mix thoroughly. After pour batter into a hot coffee whisk for several minutes. Cover the bottom of the form of parchment, pour the dough (if your form 16-20 cm, divide the dough into equal parts and bake a few cakes), it will be enough liquid - do not let that bother. I bake the cake (24 cm) 50 minutes. Perhaps on the cake smaller diameter take less time, check with a toothpick. Chocolate and coffee cake is ready! Wait until it has cooled slightly, gently pull out of shape. If necessary, trim the tip (it can go up if the heat in your oven is unevenly distributed). 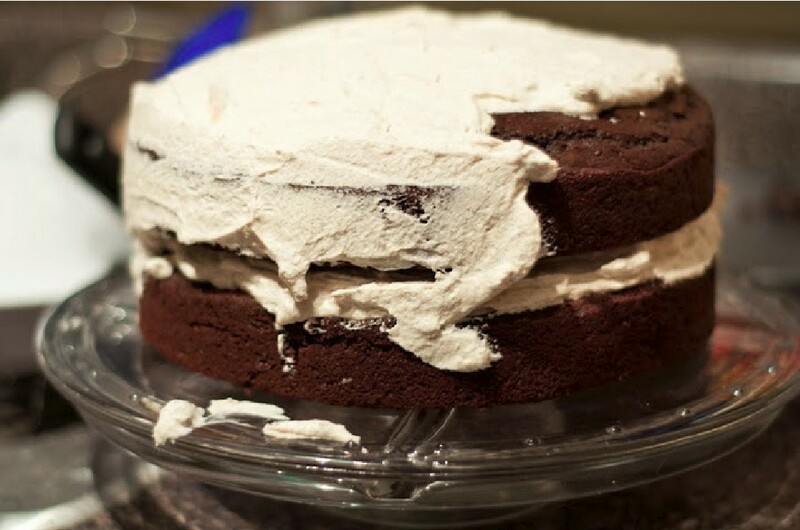 A small tip to disappear, "left" without cropping, there is a small trick: by removing the cake from the mold, turn it upside down (ie put on top) - so your cake will align, after lying to cool. I really hope this chocolate-coffee handsome like you, just like me!